Background: Cancer is becoming an increasingly important risk factor in the global burden of diseases. Cancer chemotherapy has been one of the major medical advances in the last few decades. However, the drugs used for this therapy have a narrow therapeutic index, and often the responses produced are only just palliative as well as unpredictable. In contrast, targeted therapy that has been introduced in recent years is directed against cancer-specific molecules and signaling pathways and thus has more limited nonspecific toxicities. This paper reviews about 2D, 3D QSAR and G-QSAR on a set of thiazolyl-pyrazole derivatives to identify novel and potent EGFR-TK inhibitors and elucidate structural properties required for anti-EGFR-TK activity. The 2D QSAR studies were carried out by multiple regression method and the r2 and q2 values were found to be 0.81 and 0.72 respectively. The 3D QSAR was performed using method k-nearest neighbour–molecular field analysis (kNN-MFA) with simulated annealing variable selection approach; a leave-one-out crossvalidated correlation coefficient q2 = 0.87 and non-cross-validated correlation coefficient r2 = 0.93. G-QSAR was performed by generation of multiple models of the same training and test sets as used in 2D & 3D QSAR by multiple linear regressions. G-QSAR was carried out using template based fragmentation scheme and forward variable selection method. Docking analysis was performed further and is suggestive of binding affinity with standard compounds. Methods: Molecular modeling, structure based drug design and docking analysis studies were performed. 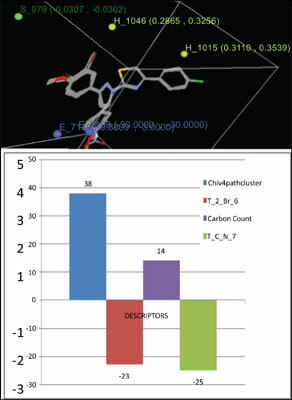 Initially molecular modeling studies (2D, 3D and G-QSAR) were performed on a set of thiazolyl-pyrazole derivatives. A lead nucleus was predicted and with the help of CombiLib; VLife MDS and Lipinski&apos;s screen 12 novel chemical entities (NCE’s) were designed. They were then subjected to docking and were further filtered. Five compounds having potent EGFR activity having drug like pharmacokinetic profiles were predicted. Results: The lead nucleus required for anti-EGFR activity could be predicted. The NCE&apos;s could then be designed, docked. Erlotinib was considered as the docking standard and it was found that these compounds mimic Erlotinib and bind to the same amino acids pocket region of active binding site of Erlotinib in PTK receptors with much higher affinities involving more number of H bonds with shorter measure, higher number of good vdW bonds and lesser number of/number bad/ugly vdW interactions. Thus they show enzyme specificity and are developed as selective PTK inhibitors having potent anticancer activity. These compounds with potent anticancer (anti-EGFR activity) along with their Absorption, Distribution, Metabolism, and Excretion (ADME) properties by means of Qikprop 2.2 Tool of, Schrodinger, could be successfully predicted having drug like pharmacokinetic profile. Conclusion: Molecular modeling is one of the most successful and rapidly growing techniques. It not only helps in predicting target specific compounds but also helps in reducing cost of valuable chemicals. In this study successful use of molecular modeling was done and caution was taken to avoid any chance co-relation. Optimization was done to obtain lead nucleus and after designing NCE&apos;s and docking five compounds with potent anti-EGFR activity and drug like pharmacokinetic profile could be successfully predicted. Keywords: 2D-QSAR, 3D-QSAR, EGFR, molecular docking, protein kinases, cancer. Keywords:2D-QSAR, 3D-QSAR, EGFR, molecular docking, protein kinases, cancer. Abstract:Background: Cancer is becoming an increasingly important risk factor in the global burden of diseases. Cancer chemotherapy has been one of the major medical advances in the last few decades. However, the drugs used for this therapy have a narrow therapeutic index, and often the responses produced are only just palliative as well as unpredictable. In contrast, targeted therapy that has been introduced in recent years is directed against cancer-specific molecules and signaling pathways and thus has more limited nonspecific toxicities. This paper reviews about 2D, 3D QSAR and G-QSAR on a set of thiazolyl-pyrazole derivatives to identify novel and potent EGFR-TK inhibitors and elucidate structural properties required for anti-EGFR-TK activity. The 2D QSAR studies were carried out by multiple regression method and the r2 and q2 values were found to be 0.81 and 0.72 respectively. The 3D QSAR was performed using method k-nearest neighbour–molecular field analysis (kNN-MFA) with simulated annealing variable selection approach; a leave-one-out crossvalidated correlation coefficient q2 = 0.87 and non-cross-validated correlation coefficient r2 = 0.93. G-QSAR was performed by generation of multiple models of the same training and test sets as used in 2D & 3D QSAR by multiple linear regressions. G-QSAR was carried out using template based fragmentation scheme and forward variable selection method. Docking analysis was performed further and is suggestive of binding affinity with standard compounds.